We believe that a web-to-print storefront should be more than just a place for customers to come and buy business cards. It should be a dynamic, interactive portal that empowers your customers, letting them manage their business on their own schedule, as well as a powerful tool for you to attract new clients and grow your business. Your PressWise system includes unlimited web storefronts, designed to help you capture more business, lower your service costs, and retain your valuable accounts. You can create unlimited customer accounts, each with a built-in website and catalog of documents and other collateral. There are NO HIDDEN FEES and no limit to the number of templates, products, catalogs, accounts, or orders you can create within PressWise. If you already have customers on other web-to-print products – no problem! 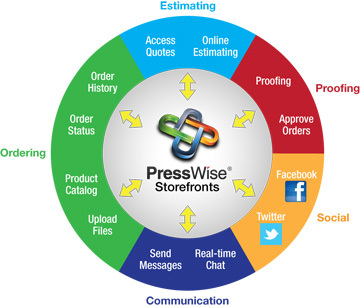 PressWise integrates seamlessly with most leading web storefront products and many customers use both PressWise storefronts and third-party storefronts to serve their clients. Plus, because all storefronts are fully integrated into our MIS suite, there is no rekeying of data required. Turn online estimates into electronic barcoded job tickets that flow direct to press and through production, finishing and shipping without the need for manual touches, so you become more efficient and your jobs more profitable.